Last November, Amazon ended a 14-month competition with a surprise decision to split its second headquarters between New York City and Arlington, Virginia. Politicians in these two eastern cities celebrated their victories and prepared for an influx of Amazon employees, but a second surprise soon eclipsed the first. Last month, Amazon announced it would pull out of its New York City agreement after facing backlash from politicians, unions, and local activists. Regardless of the outcome of each deal, the now-public offers allow us to analyze the tradeoffs that local policymakers were willing to make to attract Amazon. And the subsidies offered were no small sum. Every dollar spent by a state or municipality on corporate handouts is a dollar that could have gone to lowering taxes or to a valuable government service like safety, education, or infrastructure, and many of these alternate investments have substantial job-creating potential. To make matters worse, subsidies typically don’t sway corporate location decisions, meaning that subsidies are a waste of public resources. In fact, Amazon based its final decision on factors besides handouts—like the availability of tech talent in the local workforce. 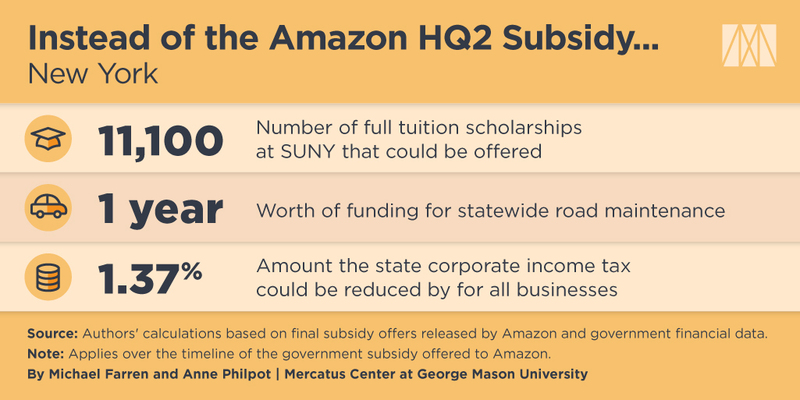 The subsidies offered to Amazon for HQ2 provide a useful illustration of the inherent tradeoffs created when politicians provide government privileges to specific companies. Using the publicly-available agreements between Amazon and the winning states and municipalities, we estimated how much each winning municipality and state could spend on expanding public services or reducing taxes over the life of the subsidy instead of providing the subsidy. To calculate these tradeoffs, we compare the subsidies offered by the winning states and municipalities with the anticipated future state corporate income tax revenue and with the anticipated cost of providing various public services over the same time period. For more on our methodology, see the appendix of our recent study, "Amazon HQ2 Is the Only Competition Where the Losers Are Winners." Our calculations show that New York could instead use this money to pay for 11,100 full-tuition SUNY scholarships each year for 15 years, to reduce the corporate income tax paid by all businesses by 1.3 percent for the duration of the subsidy, or to fully fund an entire year of statewide road maintenance. 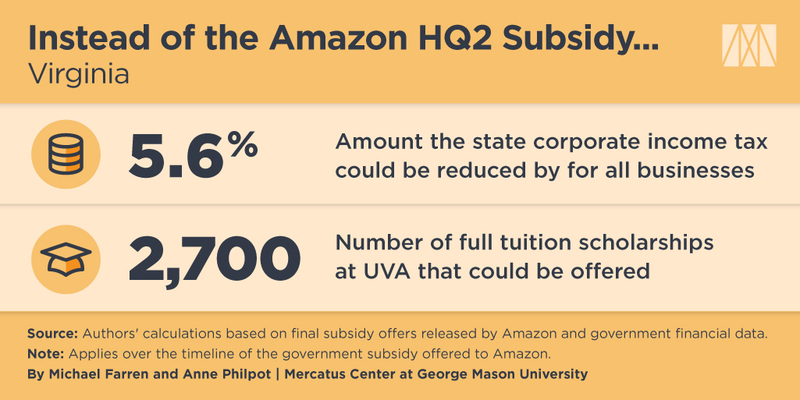 Virginia offered Amazon subsidies and perks worth $845 million over 15 years (with an extra $200 million possible over the following 10 years). Our calculations show that Virginia could have used this money to pay for over 2,700 full-tuition UVA scholarships each year for 15 years or to reduce the corporate income tax paid by all businesses by 5.6 percent for the same time period. While Tennessee didn’t win the official HQ2 prize, Amazon announced the development of a new operations center in downtown Nashville. Predictably, subsidies were involved. 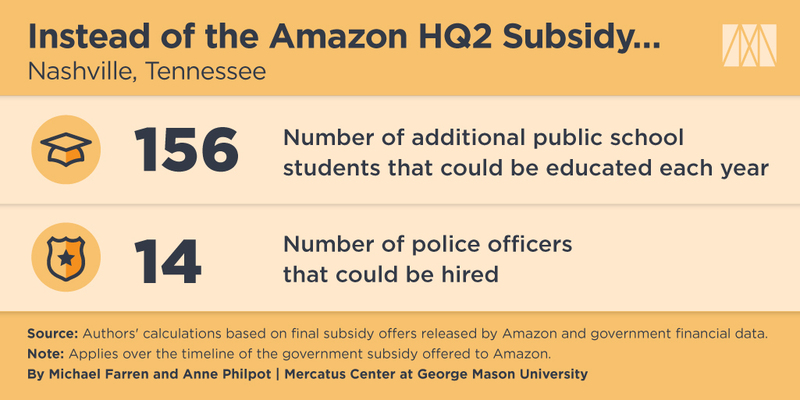 Tennessee offered Amazon a total of $87 million over seven years. Instead of this handout, the state could have provided 800 full-tuition University of Tennessee scholarships each year for those seven years. 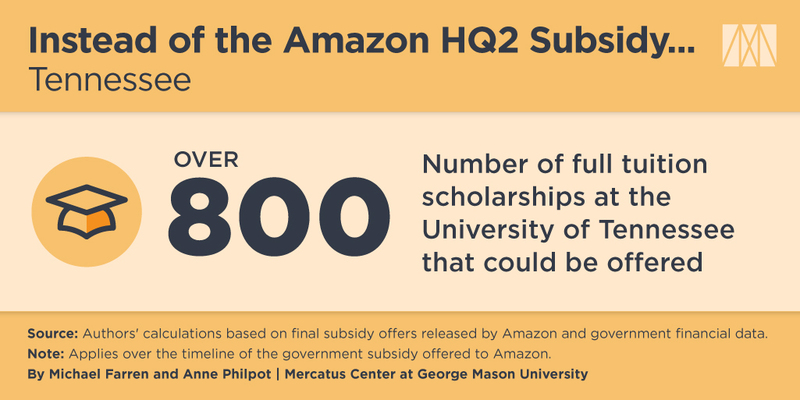 It wasn’t just states that offered subsidies to Amazon—municipalities like Arlington County offered them as well. 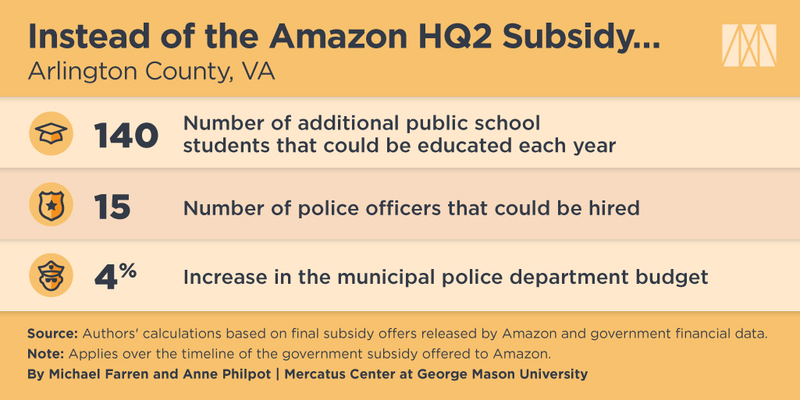 Arlington offered Amazon a total subsidy package of $51 million over 15 years, which could have instead been used to educate 140 additional public school students, hire 15 additional police officers, or expand the existing municipal police department by 4 percent. Music City offered Amazon a total of $15 million over seven years. Nashville could have instead educated 156 additional public school students or hired 14 new police officers over those seven years. New York City offered Amazon nearly $1.3 billion in tax credits. Amazon would avoided property taxes for 25 years, worth $386 million, and would have been eligible for business income-tax credits worth $897 million. But in comparison, the city’s combined subsidies could have instead funded 240 additional police officers or paid for the cost of educating 1,400 public school students for 25 years. Amazon’s NYC HQ2 site would have also benefited from a fast-tracked environmental review, the city’s use of eminent domain on behalf of the company, and even a helipad. Regardless of the actual subsidies offered, government-granted privileges create major problems in the U.S. economy. The Amazon HQ2 episode has cast a brighter spotlight on these challenges and has provided greater motivation to find a solution. This post has been updated to reflect updated information about New York City’s offer and reflect Amazon’s decision to withdraw from New York City.